Howell Construction was hired for this corporate interior renovation to be the general contracting partner. 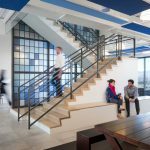 Throughout the project, Howell worked with McGraw-Hill, CBRE and Gensler to ensure all goals were met. 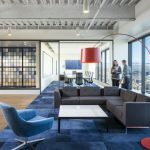 The purpose of this project was to merge two McGraw-Hill companies (Bentek Energy and Platts) into a centralized location in Downtown Denver. Both the building and project were LEED® certified. Project scope included installation of connecting stair between floors 19 and 20, installation of DIRTT wall systems, high-end finishes, upgraded audio-visual systems, creation of micro kitchens and employee lounge areas. The entire project was built on an existing raised flooring system.